My wife and I were privileged to have her uncle, John Maresca stay with us for a few days last week. He was in town to speak at his 1959 Yale class mini-reunion. I immensely enjoy his company which is far too infrequent. I was able to indulge myself in three days of continuous discussion of geopolitics, history, the Cold War, economics, politics, books and the general history of the world post the Second World War. I spend my days working in the technology business; the three days Jack was with us was a rare over indulgence in my favorite subjects. Jack even stayed up late to watch the Celts fall to the Heat in game 2 with me. The subject of his speech to his Yale class was that the war of his generation was not Korea, not Vietnam, but rather the Cold War 1945 to 1989. We were honored to sit at a table with a two-time survivor of an attack on the WTC. In the course of our discussions, I provided Jack with my mini-thesis on the economy of the US post 1989 till today. The basis of my thesis, which I have hinted at before on this blog, is rooted in the expansion of credit without an accompany expansion of higher capital ratios and reserves. I bring this up because in course of my many discussions with Jack, I said that I thought Greenspan, Larry Summers and others were the team that failed theUS. On one had they oversaw a great expansion of credit and debt, but they did not oversee an accompanying expansion of capital reserves. All of this has been discussed before, I would simply say that if the money multiplier stays were it is, we well have a lot of Friday’s like last week ahead of us. 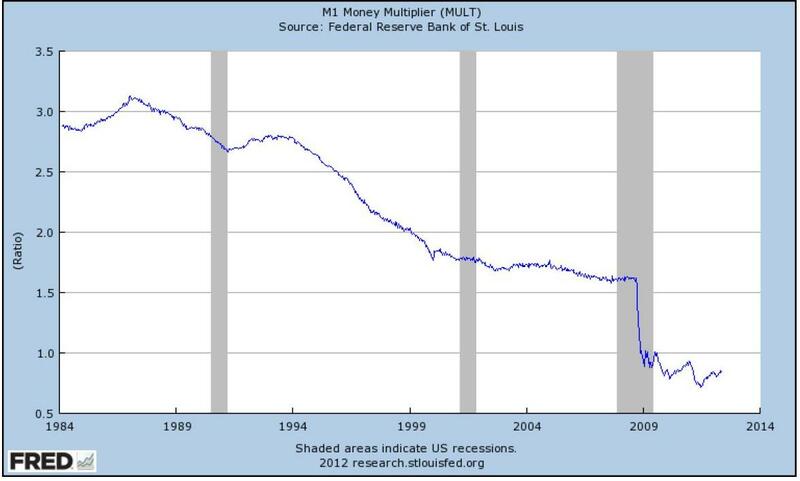 I posted some charts from the St. Louis Fed. 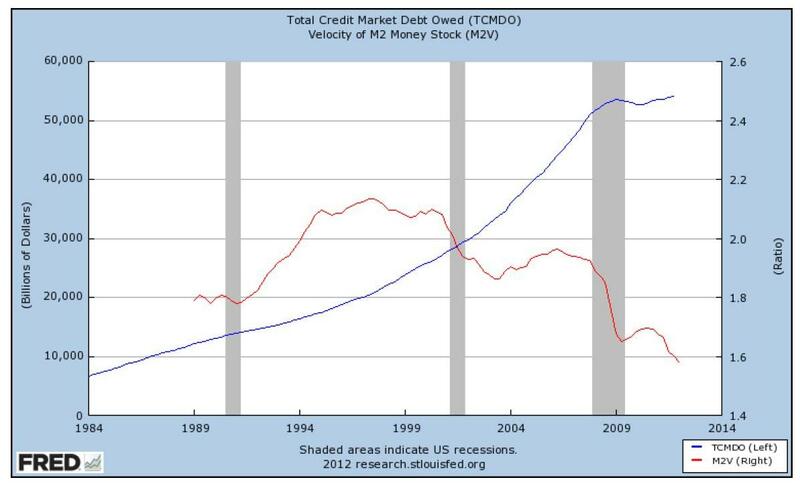 If you look at these charts and see the expansion of credit, it makes CEOs who talk of productivity gains in the 1990s look like fools. Do not underestimate what expanding credit debt levels can do make everyone feel good and look like geniuses. AG: The complexity of the models are still too simple to capture human nature. That is the problem. AG: During the euphoria bankers would tell me they were under pricing risk, but they were forced to play the game. Was that a BOD level problem? Why were bankers forced to play the game and under price risk in the market like the others? AG: 20 years ago it seemed that banks were very cautious on how they booked reserves. The mathematicians took over and said your reserves are wasting money and today it seems the banks are low on reserves. Part of this accounting issue, some of this is a philosophical style. Earnings and profitability pressures to mark to market have caused more problems than have capital reserves. SE: Banks in the US are under capitalized, no reserves, pace of credit problems are accelerating, they have not come to grips to with their problems and I would not own a single bank in Florida. The only good news is the banks in Europe are in worse shape. SE: Capital market problems are worse. Rating agencies have no idea what they are doing. SE: The buyers of structure mortgage products are structured mortgage people. It is Ponzi scheme. SE: What is a SIV? It is 5% cash, 5% Treasuries and 90% asset backed paper, which is leveraged 20 to 1 based on ratings from the ratings agencies published in the paper…what a joke. Four years later with the Europe experiment on the brink of failure, the gains of the Europe Economic Union, which were possible through the stability provided by the winning of the Cold War, now look to be at risk. I wrote some of this before, but not is such direct terms. In the past I wrote that “it is clear that many nation-states are working through the stages of political change or revolution fueled by the global credit crisis of 2008.” The question I should ask my wife’s uncle is: will I be writing a history of the Second Cold War in thirty years? What was his answer to your question?